— From Canada, Alice Munro’s Too Much Happiness lived up to very high expectations; Deborah Willis’ debut collection, Vanishing and Other Stories, was a very pleasant surprise. — From the U.S., Maile Meloy (Both Ways is the Only Way I Want It) was new to me, but I’ll be reading more of her in the future. Daniyal Mueenuddin’s linked stories, In Other Rooms, Other Wonders, offered a short course in modern Pakistan history. And Elizabeth Strout’s Olive Kitteridge deservedly won last year’s Pulitzer, drawing comparisons to Sherwood Anderson’s classic collection, Winesburg, Ohio, a book that I am very happy I finally discovered. — Colm Toibin’s Mothers and Sons confirmed that the Irish author is every bit as good a short story writer as he is a novelist — and provoked me to order a couple of William Trevor collections to re-visit the acknowledged Irish master of the short story (stay tuned on that front). Kazuo Ishiguro’s Nocturnes may not have been up to his best novels, but was a worthwhile read. — And of course I did reread my favorite short story collection of all time, J. D. Salinger’s Nine Stories. I don’t consider myself a particular advocate of the short story, although as a Canadian reader I suspect I read more than many international, particularly UK, readers do — it seems to be a format that attracts more talented writers here than it does elsewhere. And I was somewhat surprised to discover that I had read so many good collections in the last 12 months. 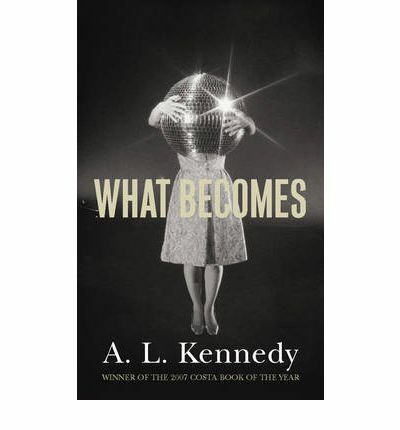 All of which is a very long introduction to A. L. Kennedy’s What Becomes. Kennedy is an oft-published Scottish writer of considerable reputation (this is her tenth fiction book) and positive reviews of this collection at booklit and dovegreyreader did put the book on my radar. Kennedy’s Canadian publisher, House of Anansi, recently released the volume here, so now I can add a Scot to my short story resume. What Becomes includes 12 stories and calls for a reading discipline that is often beyond me. All short story collections benefit from an approach that says you should only read one or two and then set the book aside for a while (a trait that I have admitted before that I find difficult to practise). Kennedy demands it — both her prose style and content have a lot of similarities from story to story. Read too many at once and they start to run together — space them out and you can appreciate the author’s talent. Or you could simply stand in your shop and hear yourself dying and do the job that is supposed to pass your time — and then see her. His day — that day — had not been ready for seeing her. His days were not ambitious in that way. Other customers had been about because it was lunchtime, but they were just the usual. She wasn’t. She was made of something different. Silly how you went home and you thought about her, having nothing else to occupy you beyond a small number of television programmes about Hitler and sharks, anything else being really too much of a challenge, if not an insult, to the mind. A lonely man needs to decide whether to take a risk. Even though “Edinburgh” is only the third story in the collection, the reader is pretty certain it won’t turn out well. Kennedy is more interested in exploring life’s disappointments than its successes and she does it well. As you can see, sometimes the author piles up the losses to enable her to contemplate how they relate to each other. Once every month they swim together: six gentlemen sharing a leisurely day. They choose whoever’s turn it is to be host, fire off the emails, travel however far, and then rendezvous at a swimming baths and christen the Gathering. They call it that because of the movies with the Highlander in, the ones with everybody yelling at each other — There can be only one — and mad, immortal buggers slicing off each other’s heads with these massive swords. You have only got the one head and shouldn’t lose it. The six all share a kind of loss, but that isn’t what Kennedy makes the story about. Rather, it ends up focusing on a school teacher who objects to their presence at the pool because it upsets her young students who are also out for their swim. I hope those three examples supply an indication of what What Becomes is about. And perhaps more important why you need to give Kennedy the time to explore in depth what her collection sets out to achieve. None of the stories are cheery (despite the fact that Kennedy is also a stand-up comedian in Glasgow); but every one does examine in detail the particular theme that she has chosen. That is what good short story writers do: They accept the limitations of the format, realizing that is what allows them to paint their limited story in painstaking detail. Kennedy does that with considerable talent — like Meloy, she is another author whom I will be investigating further. I have included copies of the covers from both the Anansi and UK versions with this review. While they are very different, Kennedy has been well-served by both designers. Her collection has the other-worldliness that the UK cover with its “disco” ball evokes; equally, it has the penetrating introspection that the Canadian cover implies. If you want 20 minutes worth of reading that combines both a level of disturbing fantasy and equally troublesome but intriguing details, any one of the dozen stories in this book will fill the bill.